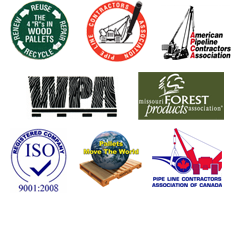 We utilize the PDS program for pallet design, thus insuring pallets which perform to all of your demands. If you have a need for any size or type of wooden pallet, we can provide what you are looking for. We can design and manufacture wooden crates or wooden boxes to meet all of your needs. We design all sizes and types of wooden boxes and crates. We can supply crane/timber/construction mats in a variety of sizes. The sizes vary from 16' to 40' in length and from 8'" to 12" in thickness. The ends of all mats are sealed to help prevent checking. We supply both green and dry wood fibermaterials. We also have the ability and equipment needed to produce quality wood char to meet the standards our customers need. Garnett Wood Products can supply all of your mat and skid needs. We can supply crane mats, timber mats, and construction mats in a variety of sizes. The sizes vary from 16′ to 40′ in length and from 8′” to 12″ in thickness. Most of our mats are the standard 4′ in width. We utilize all mixed hardwoods for our mats with quality fasteners for the hardware. The ends of all mats are sealed to help prevent checking. We also supply laminated mats which are available in a variety of sizes. We are dedicated to supplying quality products and superior service. Garnett Wood Products is a broker of wood fiber to a multitude of customers. We can supply both green and dry materials. All materials are delivered on walking floor trailers. Garnett Wood Products utilizes wood fiber or waste to produce granular wood char. We have the ability and equipment needed to produce quality wood char to meet the standards that our customers may need. Garnett Wood Products is a broker of wood fiber for a multitude of customers. We can supply both green and dry materials. All materials are delivered on walking floor trailers.